Born in Nice, the painter and sculptor Arman Fernandez, known as Arman (1928-2005), was the founder with Yves Klein and the art critic Pierre Restany of the artistic movement Nouveaux Réalistes. Their intention was to challenge the dogma of abstraction and to restore the importance of everyday objects, which Arman transfigured by massing them, by “freezing” them in transparent plastic cubes or by destroying them, creating work of great originality and power. His famous Colères literally explode the objects he uses: musical instruments with their component parts scattered across the canvas or in space. 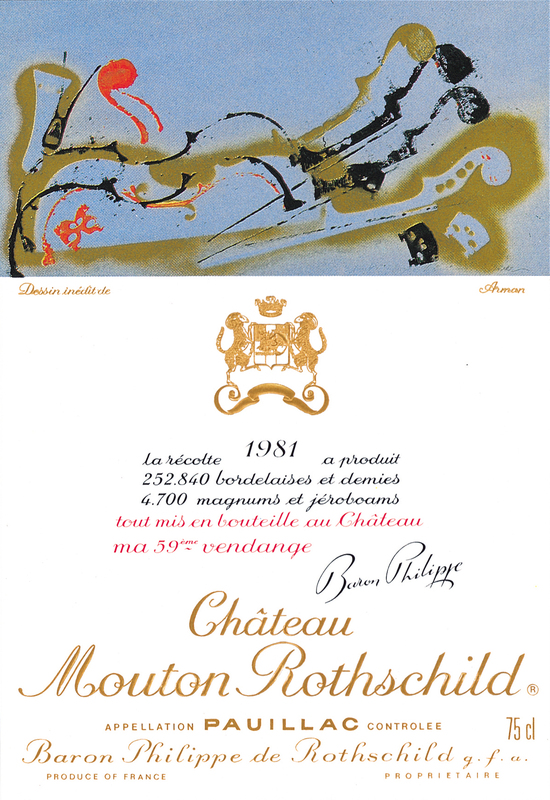 His coloured composition for the Mouton Rothschild 1981 label returns to a favourite theme, the exploded violin.